O.k. I don't think many of you have look into Qlandkarte GT Sourcecode every day so noone could have spilt the news already. A few days ago I got in contact with Oliver, the Author from Qlandkarte GT (I had been in contact with him before - but that was because I had probs compiling Qlandkarte and there were no Binaries yet) and I asked him whether he could adapt the rendering engine. And less than 36 hours after some more talk I can present you a screenshot taken with the latest Qlandkarte GT (compile from SVN for now if you want) of the openmtbmap. So all Linux and Mac Users can from now on enjoy the openmtbmap and send it to their GPS (needs compiling driver too for now) without any need to resort to Windows. And for everyone that aked for precompiled gmapsupp.img, sorry won't come. Just use Qlandkarte GT (installing a map needs nothing more than opening the .tdb from within Qlandkarte) from now on. Here are two Screenshots (click to open fullsize image in 1520x954). And here one example of why I consider QlandkarteGT the best progam for planning! You can put the Openmtbmap as an overlay over your existing Geotiff Rastermaps. Great to see eventual shortcomings in the OSM data and to find out where you should go next for mapping. 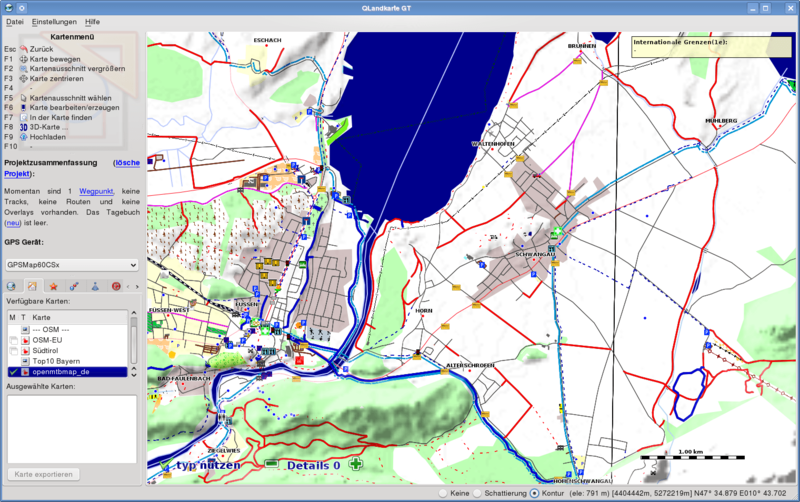 The raster maps displayed on the following screenshot is copyrighted by the LVA Bayern. Note that it will be compatible with the upcoming v .13 or you can get it now already if checkout SVN. Also if you've read down till here - maybe you fancy helping Oliver by writing code so that Qlandkarte GT will support autorouting in future too. 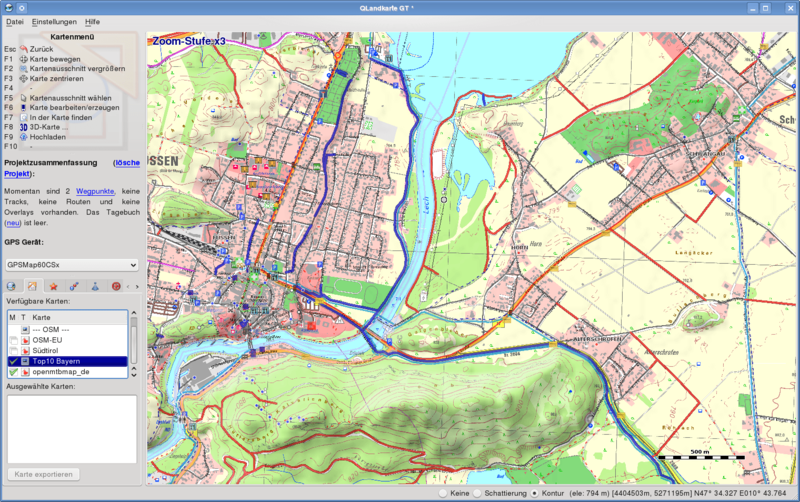 Qlandkarte GT is much more than a simple viewer for Openmtbmap.org however. In effect it's the best program (except expensive heavyweights like TTQV or Oziexplorer) for displaying Raster maps. Meaning you can view and rotate any of your scanned old paper maps, ...... But you will get most out of it when you start putting a transparent openmtbmap.org over your rastermaps.... and put SRTM file behind to view all maps in 3D view (which is actually in my eyes by far the best 3D view available compared to other progs). To activate the correct rendering of openmtbmap.org in Qlandkarte go to Settings --> Garmin maps --> and activate the "Bitmap" checkbox. Note that the current maps still display with some errors. This will be corrected by the next map update.